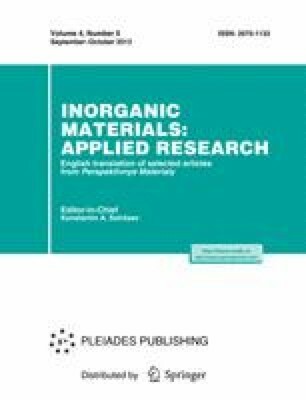 Morphology of the surface and local ferroelectric properties of thin lead zirconate titanate (PZT) films synthesized by the sol-gel technique are studied by scanning probe microscopy. It is shown that the surface of the films has quite low roughness of ∼2 nm and small average grain size of 20 nm. It is found that the film is polarized under impact of a positive or negative potential applied to the “probe-sample” system. The relaxation times of signals of residual ferroelectric responses are measured, and the rate of the lateral movement of the domain wall for PZT film is calculated. Original Russian Text © D.A. Kiselev, M.V. Silibin, A.A. Dronov, S.A. Gavrilov, V.M. Roshchin, M.D. Malinkovich, Yu.N. Parkhomenko, 2013, published in Perspektivnye Materialy, 2013, No. 5, pp. 22–27.